Our goal at Brush Hill Transportation is to ensure a safe, pleasant and convenient travel experience. 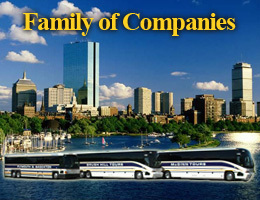 Whether you are traveling on our Brush Hill/Gray Line charter coaches, Foxwoods Resort Casino Line Run or the Beantown Trolleys, our drivers and customer service personnel are available to meet the needs of customers with disabilities including mobility, sight, hearing, and other impairments. Our drivers will assist with boarding and de-boarding buses, luggage and stowage and retrieval of mobility devices. We can help whether you are traveling alone or with a personal care attendant, using various mobility devices, or being accompanied by a service animal. Assistance is available to customers with disabilities when they travel with Brush Hill Transportation and Beantown Trolley, by contacting us at least 48 hours prior to travel. Call Brush Hill/ Beantown Trolleys at 781-986-6100. Provide us with information about your sepcific travel needs and desired date of travel or tour. We will confirm the availability with you and make all preparations in advance of your trip. Lift-Equipped Bus: When using a wheelchair lift-equipped bus, the combined weight of the customer and mobility aid cannot exceed 600 pounds. The mobility aid can be no more than 30 inches wide and 48 inches in height.